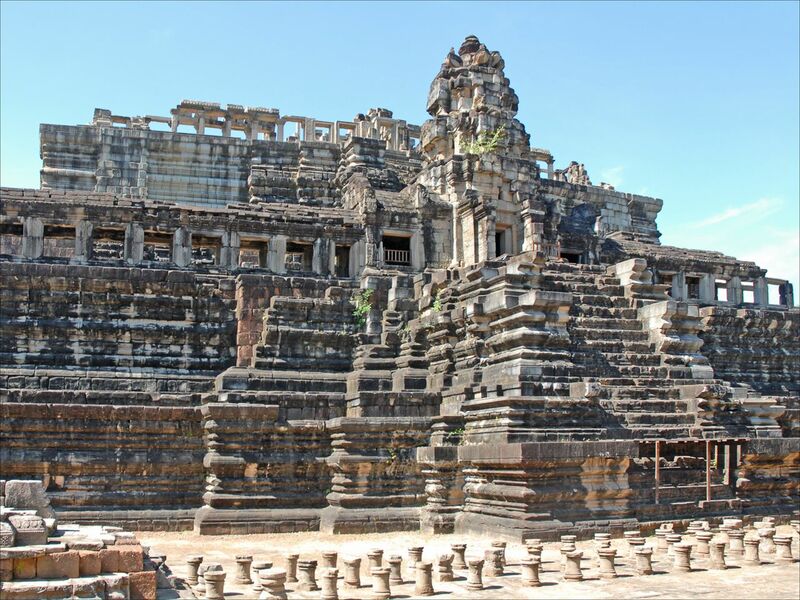 This giant temple with a 20-storied Gopura is constructed at the main temple. Two life-size elephants in concrete stand guard at the steps leading to the temple. The entire temple and temple complex, including the 249 feet tall Raja Gopura, which is considered the tallest gopura in the world. 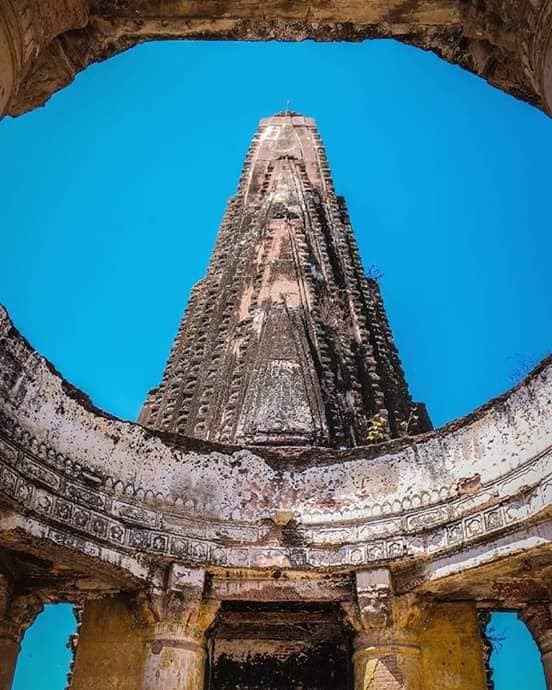 The temple authorities have installed a lift that provides a breath-taking view of the 123-feet Sri Shiva idol from the top of the Raja gopura. The origin of "Murdeshwar" is associated to Atma Linga carried by Ravan and dates to the time before Ramayana. 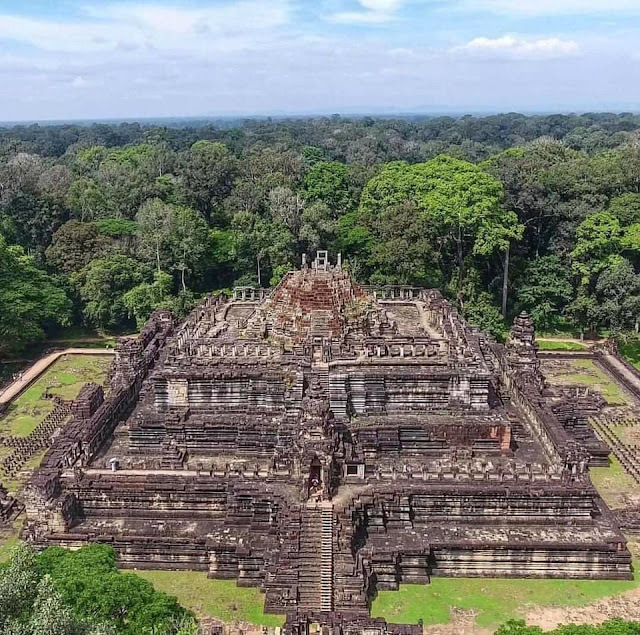 The temple is dedicated to Lord Shiva whose giant statue can been seen in #Yog mudra, lies on the holy beach town in the Bhatkal Taluk of Uttara Kannada district in the state of Karnataka, India. Situated between the Honnavar and Bhatkal town (about 12kms), about 150 km from Mangalore. 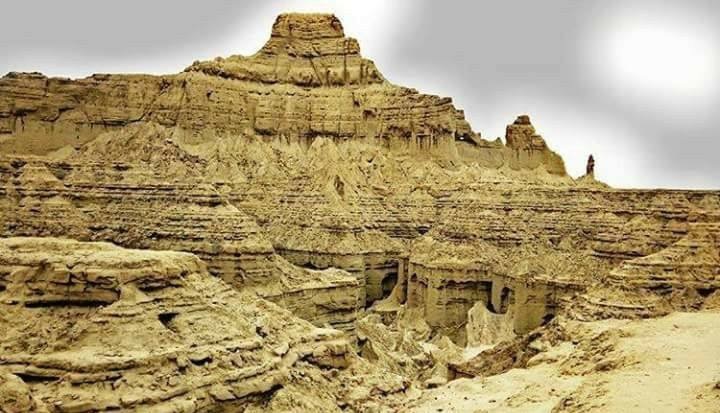 #Balochistan was part of Indian state before the blunder of partition by our political leaders. 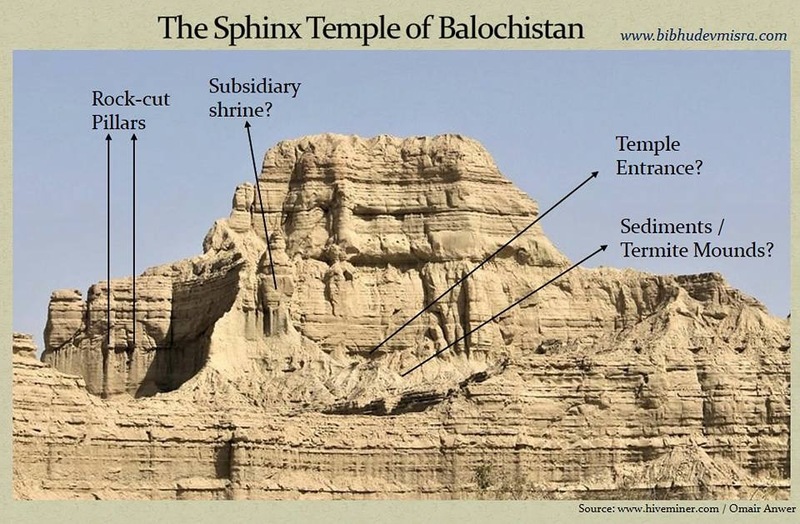 There are many faded historical and archaeological complex in the region as it was a part of the great Sapta Sindhu Civilization (The Indus). One of the gem is a vedic sphinx which is located in Hingol National Park. In the centre of the same park lies the famous Shakti peeth of goddess #Sati (Shakti) which is famous as Hinglaj Mata Mandir. This temple is situated on Hingol river bank about 250 km to North West of Karachi. This temple has very old existence and #Jayadratha (Saindhava - King of #Sindhu), brother in law of Kauravas who married the only sister named Dushala built many temples around Hinglaj Mata Mandir. 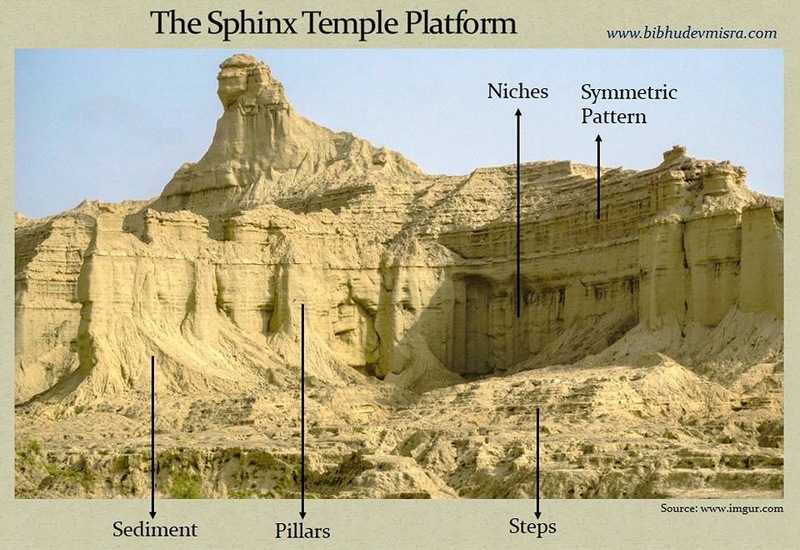 These sites predates Mahabharata (~5500 BC), and indeed this Vedic Sphinx was built by Sindhu Kingdom ruler. 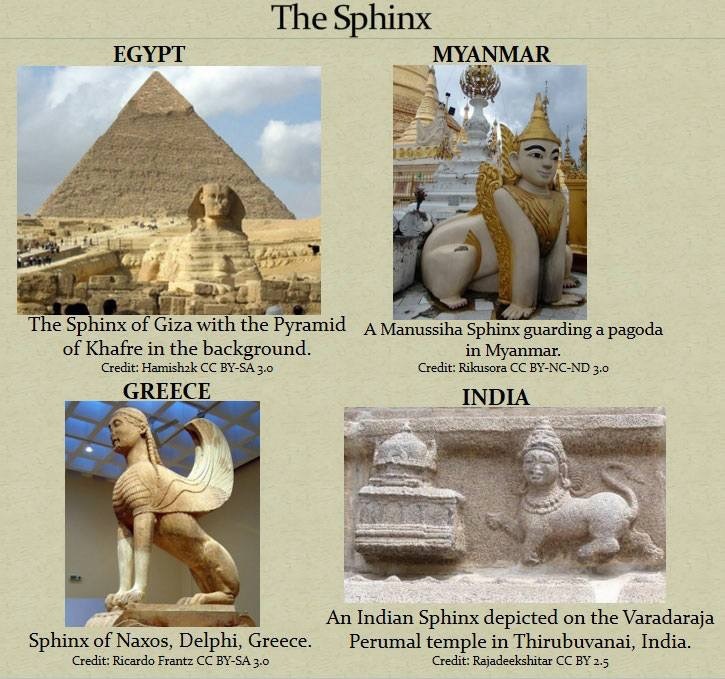 Raja Deekshithar, discovered the sphinx in Indian Civilization with a position of an animal at the gate. Many believes it's a depiction of Narasimha or Purushamriga. 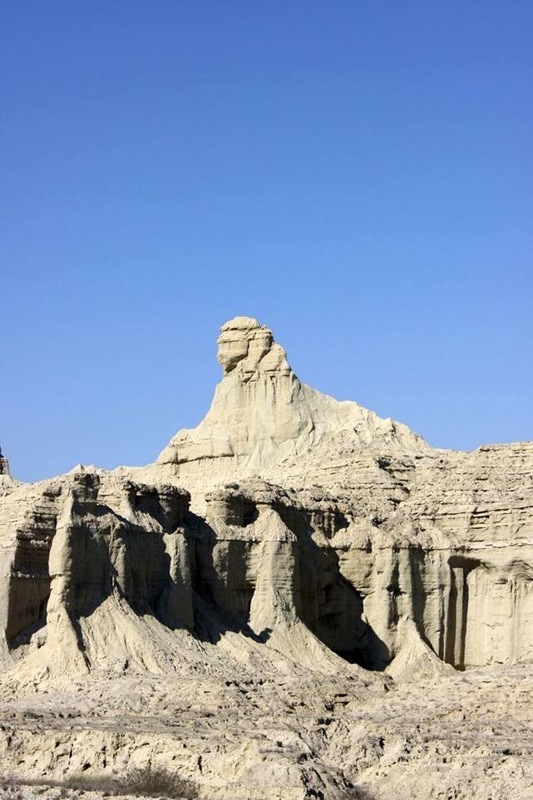 This sphinx is considered as guardian of knowledge and believed to a well flourished higher educational centre. 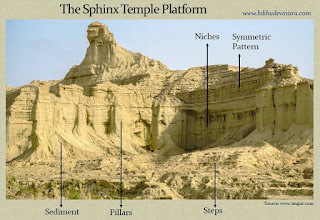 Very close to the sphinx is a Hindu temple like structure with Mandapa, the Vimana and top of Vimana is missing. 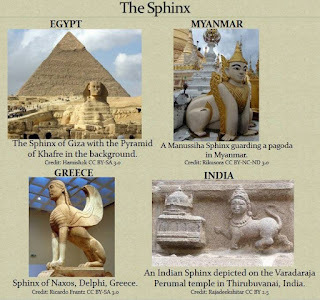 The sphinx is reclining in front of temple acting like a guardian to the temple just like Nandi Bull in front of every Shiva Temple. In one form it seems like the sphinx is worshipping Shivlinga. Almost similar image of Purushamriga was found carved out in a south indian temple (see pic 8 ). 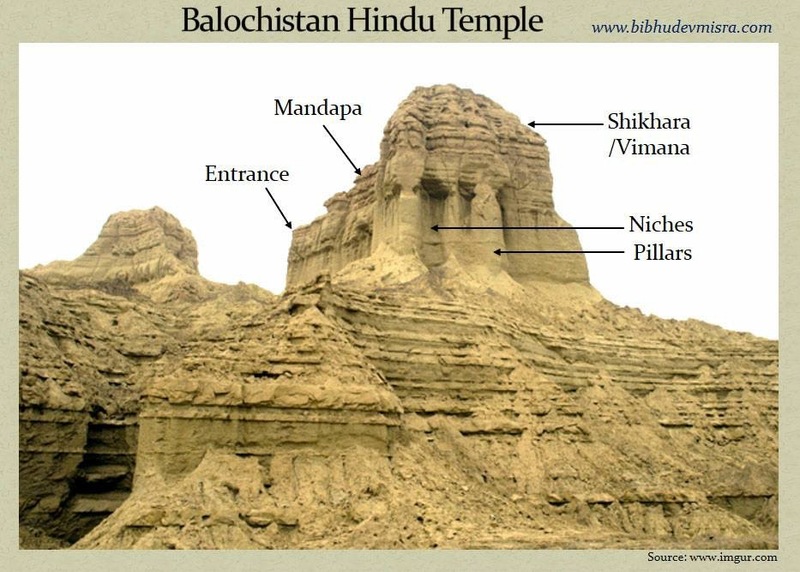 Almost all ancient temples in North India was destroyed by foreign invaders which was started by Mahmud of Ghaznavi. 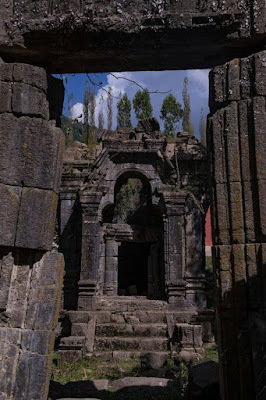 A closer look of this entire complex gives clear cut evidences of a rock cut temple which can be found almost in all parts of Country. 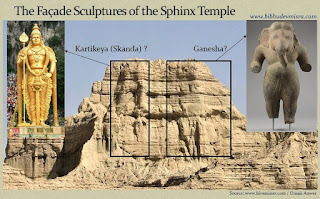 The front carving which is eroded looks like of Kartikeya and Ganesha. 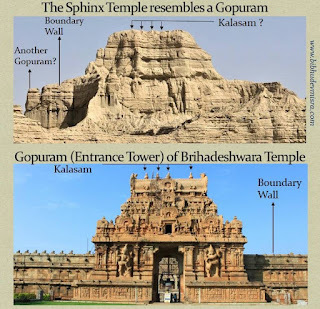 The kalasha above the gopurams have been gone due to time. The sites of Sapta Sindhu Civilization is been dated as far as 7700 BC, and further research on this master piece of Sindhu Kingdom should be studied. 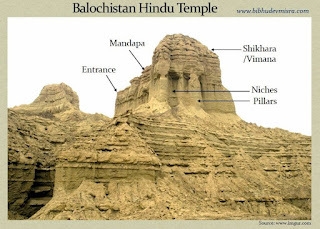 In all possibility, these temples in Hingol was built by Jayadratha or his ancestors. His father name was King Vridhakshatra. It is believed that Sindhu Kingdom was founded by King Vrsadarbh who was son of Sivi and its capital was known as Vrsadarbhpura. 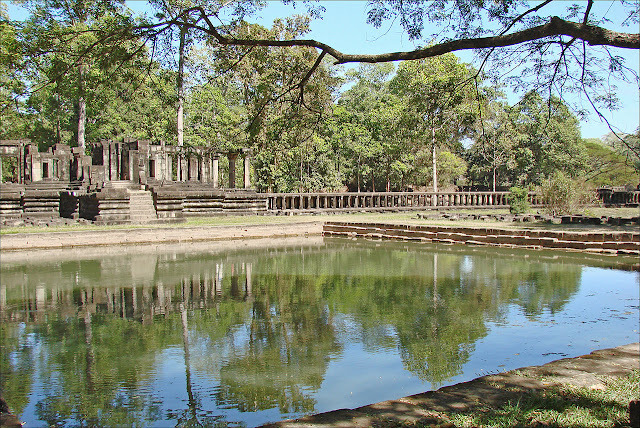 The kingdom of Sauvira was founded by Prince Sauvira. The neighbouring kingdom of Madra, Kekaya and Sindhu belonged to Madraka, Kekaya and Vrsadarbh; all four were son of great king named Shivi. #Shivi was direct descendant of #Yayati's son Anu. #Anu had three sons; Sabhanara, Chakshusha and Paramekshu. Sabhanara Son was Kalanara; his son was Srinjeya; his son was Puranjeya; his son was Janamejaya; his son was Mahamani; his son Mahamanas; who had two son #Usinara and #Titikshu. Usinara had 5 sons ; Shivi, Trina, Gara, Krimi and Darvan. Shivi had 4 sons; Vrshadarbh, Sauvira, Kaikeya and Madra. Titikshu had one son named Ushadratha; his son was Hema; his son was Sutapas; his son was Bali; whose 5 sons were Anga, Banga, Kalinga, Suhma and Pundra known as Dirghatamas. The son of Anga was #Para; his son was Divaratha; his son was Dharmaratha; his son was Romapada who also got title of Dasaratha; his son was Chaturanga; his son was Prithulaksha; his son was Champa who founded city Champa. The son of Champa was Harryanga; his son was Bhadraratha; his sons were Vrihatkarman and Vrihadratha. Vrihatkarman son was Vrihatmanas; his son was Jayadratha; his son was Vijaya; his son was Dhriti; his son was Dhritavarta; his son was Satyakarman; his son was Adhiratha who found Karna in a basket; son of Karna was Vrishasena. These were also known as Anga Kings which started from King Anga. 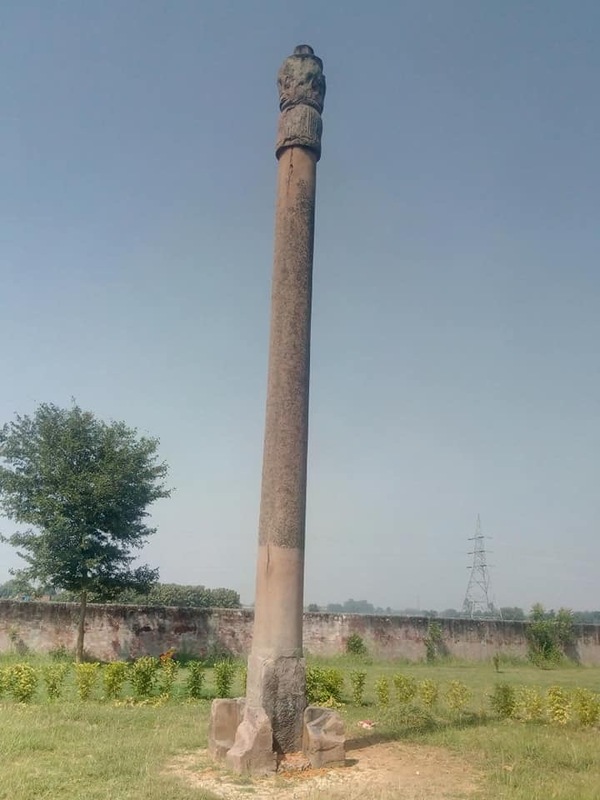 Lathiya Pillar (Jamania) is Monolithic pillar dating to the SkandaGupta period which was built on the lines of the Mauryan period (322 BC to 185 BC) although it has eight lions instead of four, the Garuda figure resting on a circle of lotus leaves, which once crowned the bell-shaped capital. Four brick temples of Gupta period has been found mostly in the form of ghost walls. 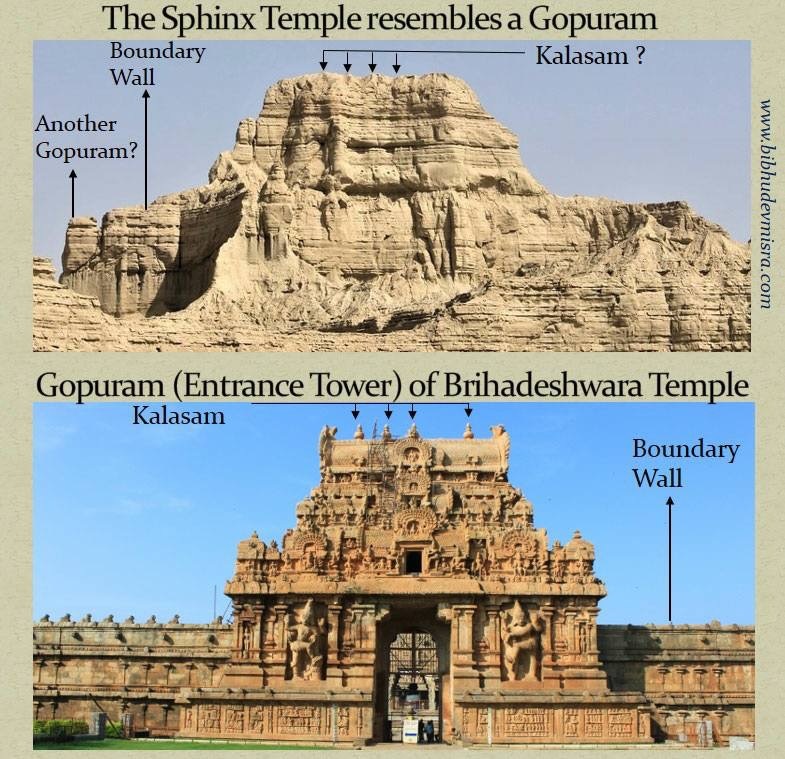 All these temples are facing east and having the same plan. These were composed of two architectural units, the sanctum (Garbha Griha) and mandapa. Stone pillar is situated west of the temple group. Temple No.1 and 2 and its enclosure wall were constructed in period II phase I and temple No. 3 and 4 were constructed in Phase II of same period. 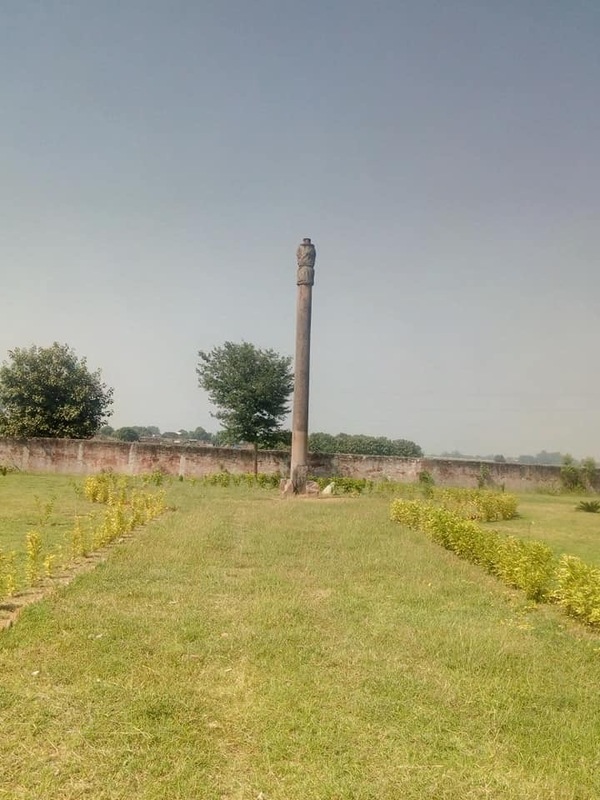 The temple site at Lathiya in Jamania tehsil has a close connection with a similar site at #Bhitari where an inscribed Gupta pillar of the time of Skandagupta stands in the vicinity of a temple. Every year Lathia mela is organised which fetches huge amount of devotees. Jamania tehsil is in Ghazipur district. Jamania gets its name from Rshi Jamdagni because of his Ashram. 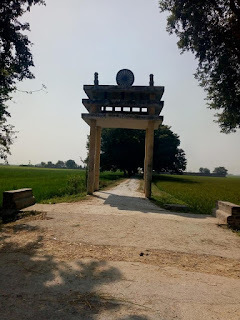 Ghazipur old name was Gadhipuri associated to King #Gadhi. King Gadhi was father of #Viswamitra and #Satyawati. Satyawati was mother of Jagdambni Rshi whose son was Parashuram. #Buxar few kms from Ghazipur is associated with Viswamitra after becoming BrahmaRishi, this was the place where #Tadka killing happened by Shri Ram and Lakshman. The site of "Ahalya getting back to life" is in Buxar which is now known as #Ahirauli. 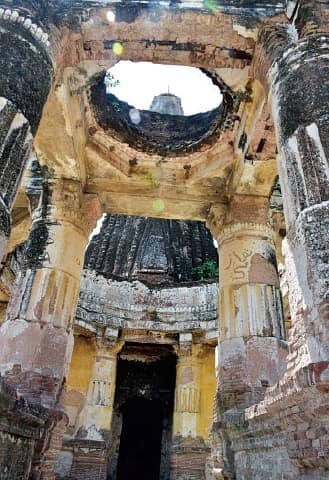 SIALKOT: Centuries-old Shawala Teja Singh temple is crumbling and needs preservation. 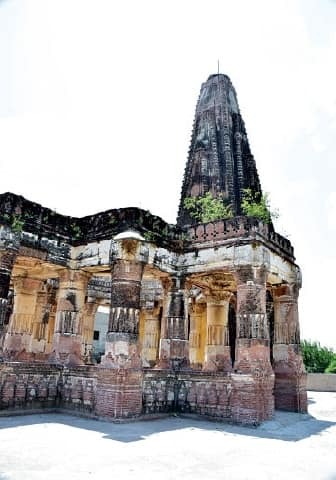 The temple, located in city’s congested Dhaarowal locality, is more than 1,000 years old, according to the book ‘History of Sialkot’ by the late Rashid Niaz. Local residents said the temple had become a haven for addicts. The temple is located on a dune along Allama Iqbal Road and one has to climb up staircases to reach the building. In 2014, the tehsil municipal administration established a family park around the temple at the cost of Rs5 million. Though the park remains full of families in the evening, the temple is under the occupation of addicts. A mob had damaged the temple, including the tombs, in 1992 while protesting the demolition of Babari Mosque in India. The Hindus of Sialkot stopped visiting the temple after the mob attack.Local Hindu leaders Rattan Laal, former District Council member, and Rumaish Kumar have urged the government to ensure the early repairing of the crumbling building of Shawala Teja Singh temple.